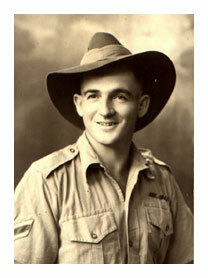 Born in Brisbane 19-11-1916, the second of son of a family of three boys. Dad at that time had a horse team pulling timber (logs) to the saw mill at Wynnum Central. I lost my mother when I was 2 ½ years old. Dad and grandmother moved to Lindum. Grandmother took on the job of raising we boys. Big depression on and dad worked all over South East Queensland in any job to help provide for us. I attended Wynnum Central State School all of my school years. Was Captain of the school cricket team between the ages of 12 – 14 years. I was good at all sports, but only about 60% at studies. I left school when I was 14 years old, worked for two weeks (from school until Christmas) on a farm at Hemmant. After Christmas I went splitting posts and rails with dad. We camped in a tent for five months and did not come out until the job was finished. I always had a shangi in my shirt when not at school whilst growing up, also keen bird egg and butterfly collector. The next big move was to Peachester just before I was 15 years old to work on a citrus, pineapple and banana farm. Here I learnt to make dampers and cook, but I worked hard six days a week. On Sundays I was off into the bush and heavy scrub with my 22 rifle. I received 4 pennies each for turkeys, pigeons, wallaby’s and flying foxes and this paid for my ammunition. Mostly I spent the time exploring the scrub and trees and this proved a big hep when I got to Malaya. When the going got tough on the citrus farm we used the barter system. We gave fruit and vegetables in return for home made butter, milk and cakes. We all lived well and healthy. The doctor was unheard of. I next spent two years dairying with my father and two brothers at Malaney, where we milked 120 cows twice a day by hand. We also kept pigs and calves, had a house cow. Together with brushing and clearing paddocks we put in 10 to 12 hour days. For 4 ½ months each year I cut cane along the Maroochy River, where I made enough to buy a car which was a big help. In 1940 I returned home to join the Army. My younger brother and friend enlisted with me and into the Army we went in April 1941. I was drafted to Redbank and sent to school at Enoggera where I was made a Corporal. After three months training I was sent to Bathurst, to make up the full strength of the 2/26th Battalion. Here I was made a Sergeant. I sailed to Singapore in August 1941, where I trained with the 2/26th Battalion for three months before being chosen to form the 27th Brigade Head Quarter Defence Force Platoon, and put back to the rank of Corporal. Moved to Sarganat in November 1941, Early December to January 1942 in the jungle. Japs landed 8th December 1941 and I moved back to Sarganat. After the 2/30th blew the bridge at Gemas, I fell back with Head Quarters and from then on it was fall back or get cut off. The Japs were coming down both coasts. We could not use the road during the day as the Japs had complete air control. Many trips out on patrol, mostly twice a day and with Brigadier Maxwell visited the 2/26th and 2/30th at night. Spent a night a Kota Tingi Bridge waiting for the remnants of the 2/29th and 2/19th to come through. The engineers blew the bridge just before day light, and I got a lift back to my unit. We finished up on Singapore Island the last days of action just out side the city of Singapore on Bukit Timah Road. I was taken Prisoner of War on 15th February 1941, and marched out to barracks at Changi. My next move was to Bukit Timah where we camped in shops. We cut off the top of Bukit Patock to make a shrine to the Japanese war dead. After five months on this job, I spent a month at Havlock Road where I worked in a ware house, then back to Changi barracks. Off to Thailand in April 1943, where I spent five days and five nights in a steel rice truck. I marched 280 km to Nikki, building bridges, then was ordered back 40 km to a big cutting. Here I caught cholera. When I was well enough, I was put to work unloading rice destined for Japanese Head Quarters from small river boats. This lasted about two weeks then I was put to work in the cutting. This was much easier than unloading rice and was supposed to be a light duty job. Because of ulcers I was sent back to Kanchaburri Hospital Camp, where they were scraped out. I was then transferred to Number 2 Camp, where men who were too sick to be taken to Singapore carried water 3 km from the river to help look after sick and dying. After being sent back to Singapore by train in March 1944, I worked on the aerodrome then as a black-smith in a nail factory for another 5 months. The war ended 15th September 1945, but the Japs made us work another two days. I was flown home in September 1945 by Catalina Flying Boat, and arrived back in Brisbane in October 1945. I started building after Christmas 1945-46. Married in March 1951, I had 5 children – 4 girls, 1 boy- and built a new home at Bald Knob. In 1964 I went into the poultry and abattoir business for the next 20 years. Purchased 40 acres of land at Peachester – 25 for me, 15 for son. Son built my new home with all local timber I had saved – white and red cedar, black bean, black wattle, beach and cypress. A piggery was built for 60 sows then later Paint Horses entered my life – first as a hobby then showing, breeding and selling. During the past few years I have had two new knee caps, complaints with both eyes and a pace maker installed. Am now back working on my property and will turn 90 in November 2006. I played a lot of sport both before and after the war – cricket, wood-chopping, tennis and horse riding and won trophies at all of them. In the later years after the war I hosted many Bar-B-Q-s for ex P.O.W’s; Rotary and the R.S.L. I have been a member of the P.O.W. Association since its inception on the North Coast, and am the only original member in the Beerwah-Peachester R.S.L. which opened in 1960. Very active member of the Peachester District. Although I was made a Sergeant 10 days before capitulation, I was told that it did not go through, but I acted as a Sergeant all my P.O.W. days.